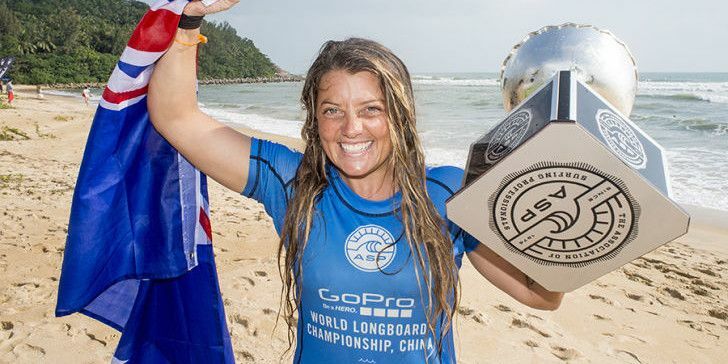 WANNING, Hainan/CHINA (Tuesday, December 9, 2014) – Chelsea Williams (AUS) has defeated Kelia Moniz (HAW) to claim her maiden ASP Women’s World Longboard Title at the GoPro World Longboard Championships, China hosted by Wanning (WLC). Near perfect 3 to 4 foot surf provided the perfect canvas for the world’s best longboarders to fight for the sport’s ultimate prize, but it was Williams, the form surfer of the event who was the last one standing. Remarkably Moniz and Williams have met in the final of the GoPro WLC four years in a row, proving that these two athletes really are on top of world at the moment. Their friendly rivalry sees them now at two wins a piece in the Final in China. CAPTION: Chelsea Williams dominating the Riyue Bay point to claim her maiden ASP World Longboard Title. PIC ASP/Will H-S.
Williams’ win today was a long time coming after finishing runner-up to the ASP World Longboard Title four times. In the first half of today’s Final Williams was struggling to adapt to the conditions and it seemed her fifth runner-up finish was minutes away, but the Gold Coast surfer struck and did some of the best nose riding of the whole event mixed with rail carves. Moniz caught a last minute wave, but just missed out on the required score, leaving Williams out the back to ride her wave in as an ASP World Longboard Champion. CAPTION: Kelia Moniz on her way to a runner-up finish. PIC ASP/Will H-S.
Moniz is a two-time ASP World Longboard Champion after winning this event the past two years and today after losing by a mere 0.02 *** she was gracious in defeat. Moniz finished the event with the highest wave score, and highest heat total from her Round 1 heat, and hinted that her and Williams’ rivalry wasn’t over yet. CAPTION: Lindsay Steinriede (USA) with her toes on the nose. PIC ASP/Will H-S.
Lindsay Steinriede (USA), 2011 ASP World Longboard Champion used her graceful and polished brand of surfing to advance into the Semifinals where she ran into a rampaging Williams. Steinriede was the last natural footed surfer left in the draw when she won her Quarterfinal and advanced into the Semis and leaves the 2014 GoPro WLC ranked equal 3rd in the world. Chloe Calmon (BRA) and her trademark stylish carve. PIC ASP/Will H-S.
Chloe Calmon (BRA) lost out in an action packed Semifinal against Moniz meaning the young Brazilian exits the event ranked equal 3rd in the world. Calmon has worked extremely hard and has improved on her 5th place finish from last year. She was one of the most interesting and exciting surfers to watch all event long, but she let her nerves get the best of her in the Semifinals. It’s highly likely that the men’s 2014 ASP World Longboard Champion will be crowned tomorrow.